The Edinburgh metal scene has had its ups and downs in recent years, not least of all with the closure of iconic venue Studio 24. Now, however, it seems to be in rude health, with a multitude of well-attended underground events taking place (see our recent Bevvy Scotland review). One of the main new homes for such events is La Belle Angele. Indeed, this November, it plays host to BOB Fest, the final all-dayer at Studio 24 last year, and one of Scotland’s longest running yearly underground events. The event has just announced that the headlining slot will be taken by the new project of ex-Venom/Venom Inc drummer, Anthony Abaddon Bray. Sadly, their vocalist Roddy B passed last year. They have been working on fresh material with the new line-up, but you can hear their last EP, Flowers Of Evil, over on Spotify in full. New music from one of the icons of the genre? We doubt this addition could have been much more metal! Also joining the bill, and fueled by a new 2018 line-up, backwoods death-thrash-sludge cult, Threshold Sicks have been getting their live chops back up to scratch at two other shows this year; Smashed Fest in Perth, and supporting Virus in Edinburgh. This keeps them fresh on the gigging front, while they continue work on the re-making of their 2nd album, Beat Unmerciful. They join Dog Tired, Forgotten Remains, King Witch, Perpetua, Iron Altar, Flat Iron, Tombstone Crow, and Hammer for a monstrous feast of riff insanity, followed by the infamous Keep It Steel club night. The energy is high, and this promises to be a pulverizing show from start to finish. 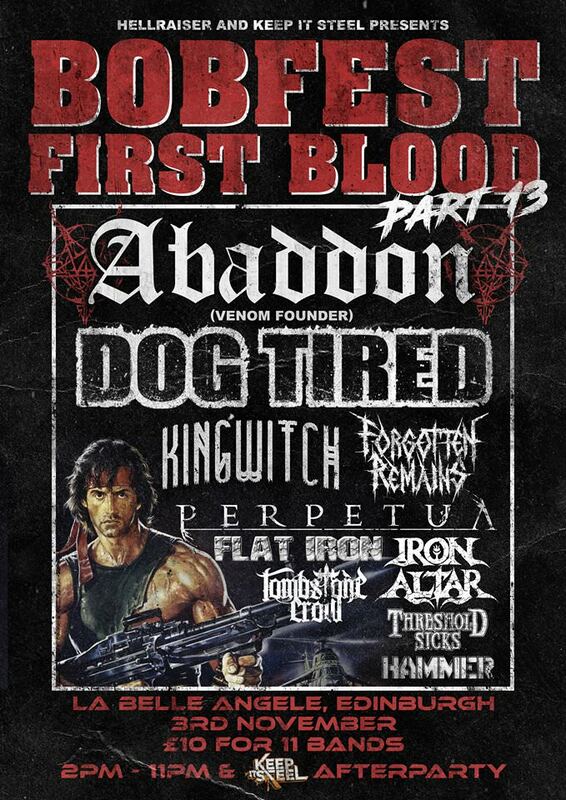 Posted in Latest News and tagged Abaddon, Bob Fest, Dog Tired, First Blood Part 13, Flat Iron, Forgotten Remains, Hammer, Heavy Metal, Hellraiser, Iron Altar, Keep It Steel, King Witch, La Belle Angele, Live Metal, Metal News, Perpetua, Threshold Sicks, Tombstone Crow.